Although not a griffon, you will find these aristocratic looking basset hounds in Spain. The Basset Bleu de Gascogne is the size of the better known English Basset Hound and French Artesien Normand Basset, but the ‘Bleu’ is distinguished from them by his coat colours. Like the Griffon Bleu de Gascogne, they are tri-color, with orange markings on the head and feet while their body is black with blue ticked markings. He is also known as the Blue Gascony Basset and it is an old breed that goes back to the Middle Ages, when he was derived from the Grand Bleu de Gascogne, possibly due to a genetic variation that has resulted in short legs. Like all bassets, he has a long body, long ears and short legs. 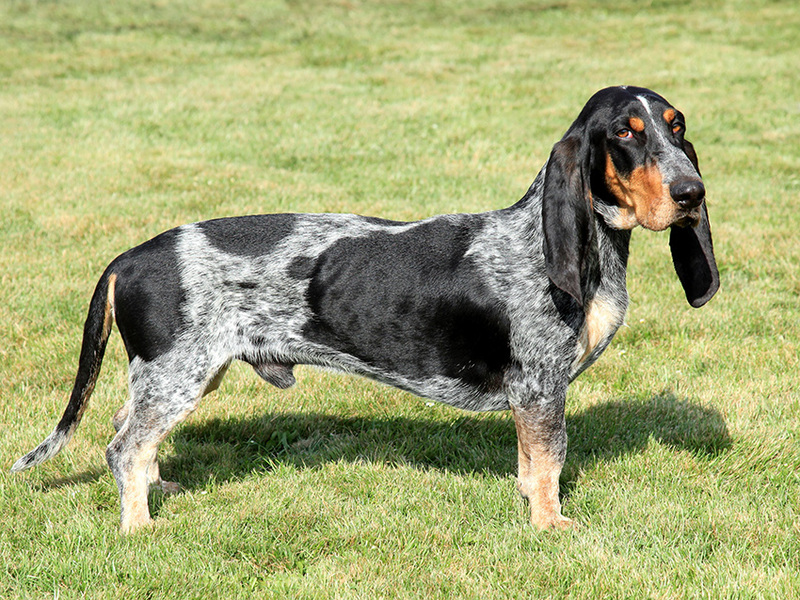 The Basset Bleu de Gascogne stands around 30 – 38 cm at the withers and usually weighs around 16 – 18 kg. As this is a short coated dog, the coat does not require any special care. The ears need regular cleaning. The Basset Bleu de Gascogne makes good company for apartment living and can be a real couch potato. But as with all other hounds, they come very much alive outside, especially when their nose finds a good trail. They are also very playful and amazingly agile and can walk and run for hours on end. So your basset needs long walks, and be outside a few hours a day. The Basset Bleu de Gascogne is generally good with other dogs, people and children. They are affectionate and easy going members of the family. The Basset Griffon Blue de Gascogne does exist too, but it is not an officially recognized breed and mainly the result of crossing a Basset Bleu with a Griffon Bleu de Gascogne. They write that their temperament is also in between that of the kind Basset and his fiercer brother the Griffon Bleu. In Spain there are several exemplars of the ‘Basset grifón azul de Gascuña’ as well, cross bred by hunters in their search for the ideal hunting dog.